Less than a month ago, my boyfriend challenged me to a mystery box cook-off. After watching one too many episodes of the Food Network show "Chopped" I was up for the challenge! So he got to pick three random ingredients and it resulted in Baked Stuffed Peppers. I was asked to do it again but rather than let Doug have free rein, I asked three people to pick two ingredients off the top of their head. Then I asked them if they liked odd or even better in order to select one of the mystery ingredients from another person. I still let Doug play along since he inspired the challenge. Since I introduced the March challenge a bit later in the month, a number of bloggers told me they would have to wait until April. So here is your chance! The $10 Starbucks gift card is up for grabs again! 1. All of the mystery ingredients must be used in one dish. 2. 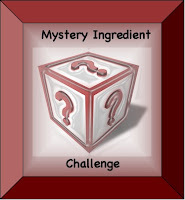 You may use other ingredients to complete the dish. 3. Post the link to your blog in the comments section of THIS post in order to be counted for the contest by April 30th at midnight. 4. Your entry should have the Mystery Box logo and a link back to this post in order to be eligible. Good luck and get cooking!!!! Stoppin' by from SITS to say "hi" and welcome. I know that you will enjoy being a part of this vibrant community of bloggers.